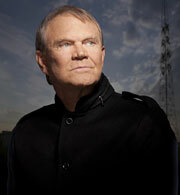 Join us as we welcome GRAMMY Award-winning country music star Glen Campbell to The GRAMMY Museum. During his remarkable career in show business, which has spanned over 50 years, Campbell has released 70 albums and has sold 45 million records. In 1967, he made GRAMMY history by winning four awards in both the country and pop categories and this year, will be honored with a GRAMMY Lifetime Achievement Award. A 2005 inductee into The Country Music Hall of Fame, Campbell has also racked up 12 RIAA Gold albums, 4 Platinum albums and 1 Double-Platinum album. While hits like By The Time I Get To Phoenix and I Wanna Live have helped make him a true country music legend, Campbell also gained fame as an actor and host of The Glen Campbell Goodtime Hour. After a brief introduction and tribute to his career by GRAMMY Museum Executive Director Bob Santelli, Campbell will perform a selection of songs. Guests will hear hits from the past as well as music from Campbell's latest release, Ghost On A Canvas, a top-ten pick in USA Today's Best of 2011.